Recommended Citation: Steen, L J. 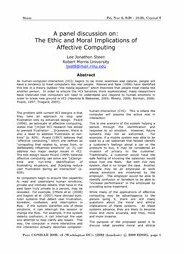 The Ethic and Moral Implications of Affective Computing. In The Proceedings of the Conference on Information Systems Applied Research 2009, v 2 (Washington DC): §2332. ISSN: 0000-0000. As human-computer-interaction (HCI) begins to be more seamless and natural, people will have a tendency to treat computers like real people. Reeves and Nass (1996) have identified this link in a theory dubbed “the media equation” which theorizes that people treat media like another person. In order to ensure the HCI becomes more sophisticated, many researchers have theorized that computers will need to understand and respond to human emotions in order to break new ground in HCI (Hawkins & Blakeslee, 2004; Minsky, 2006; Norman, 2006; Picard, 1997; Thagard, 2005).